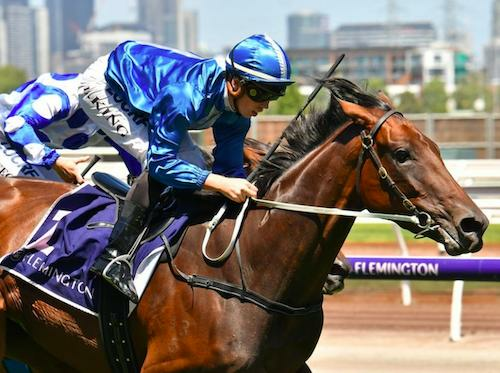 Not many horses are in better form than the Mick Price Racing trained OCEANEX making it three wins on end with Saturday's Flemington triumph. A gem of a ride from Liam Riordan saw JUST HIFALUTIN flash home and get the chocolates in the last for Enver Jusufovic. WESTERN KING had a head-strong win for Williams Racing and in fine form FREE OF DEBT takes a win for Chris Bieg and Aaron Purcell trained KHEZERABAD gains the lead for a mighty win. Following his Magic Millions success, the hot form of Chris Munce Racing has continued after SNOOPY won his seventh race from 30 starts at Eagle Farm. MAGIC FOX also showed his quick acceleration to win for the Kelly Schweida team. Gollan Racing scored a triple with EPAUMADA, BRAINS and MACEWEN while Scott Morrisey took a double with HOLBROOK and LOVE STRUCK. Jenny Graham scored a win with ART ATTACK and Laurel Oak Bloodstock had success with SWEET SCANDAL and Stephen Lee with ALATORA. LET'S TWIST caused a big upset when beating the short priced favourite to the joy of the Pearce Racing brothers - the mares second win in her last three starts. Harvey Racing also have MISTY METAL flying this preparation undefeated while Lindsey Smith didn't miss out with his honest mare FONTAINEBLEAU saluting. Leon Macdonald & Andrew Gluyas would have been delighted to see ROYAL RUMBLE salute under the guidance of Raquel Clarke in Adelaide. Meanwhile on Friday, Snowden Racing saddled up a Camelot in URALLA KINGDOM to success on debut. Local Matt Dale also saluted with TE ATA. A huge shout out to these overseas trainers on their wins - G and G Richardson and Parker, Dan Meagher, Stephen Gray, Brett Crawford, Glen Kotzen, Mike De Kock and Sean Tarry.